Rosie has been teaching for over 40 years. During this time she has taught in schools, universities and colleges and has always been passionate about empowering students to take responsibility for their own learning. She has been a student of Yoga for 30 years, a teacher of it for 15 years, 10 of which have been with The Yoga Institute. She trains Yoga Teachers on our faculty, facilitates expert mentoring and engaging and supportive classes. 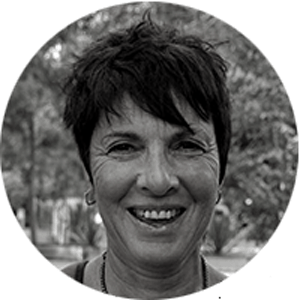 Rosie’s specialty is Yoga Therapy, helping people to cope, manage and thrive amidst some of life’s more pressing challenges. She loves to work with women, running courses, workshops and retreats and always with a focus on individualising yoga practicies with a clear intention for physical, mental, emotional and spiritual self. With a deep understanding of yoga, kinesiology and natural therapies, Rosie draws upon ancient breathing and movement techniques and the philosophy contained in age-old Yoga Sutras to nurture a harmonious and balanced body and mind. Her style and approach is simple to understand and easy to follow. It is all aligned with what students want to achieve and what they are willing, and wanting, to do. Following the lineage of TKV Desikachar, Rosie holds private one-on-one sessions as well as small classes to meet the needs of her students, encouraging them to work at their own level and pace. Whilst taking yoga and the yoga therapy sessions seriously, Rosie embraces a balance setting with lightness, a sense of humour and fun. Rosie’s classes are suited to any age and ability. Previously taught at Macquarie University Sydney (early childhood advisor) 25 years school teaching and special education teaching. Mental health, back care, seniors, palliative care, mindfulness, cancer support recovery, chronic pain and women’s health.